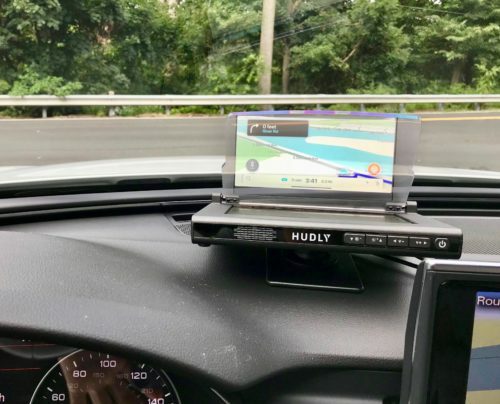 Hudly Wireless Heads Up Display is a wireless dash mountable heads up display system. It displays important information mirrored from your phone such as navigation, speed and car information. Mirroring from an iPhone is done using AirPlay and most Android devices are supported. In order to show vehicle information, an optional OBD adapter is required. A companion iOS or Android app is available. 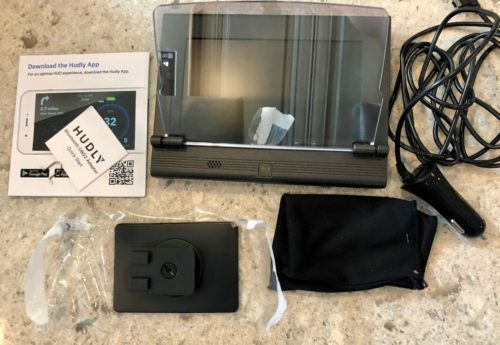 Hudly also offers a classic version which is the company’s original Kickstarter product and is not wireless, as well as a Lite version which is a less expensive version with a smaller display. Packaging of the Hudly Wireless is well done and organized. The package contains the wireless device, power adapter, mount, fabric screen protector and instructions. The optional OBD adapter comes in a separate small box. To get started, download the Hudly mobile app from the App Store. The instructions give suggestions on the best way to mount the unit. In my Audi, I was able to attach the mount to the center of my dash and run the power cable down to my power outlet. The display attaches to the mount by pressing down and sliding to the left. It is easily removable by sliding right and lifting. The OBD adapter plugs into the OBD port of your vehicle. In my case, finding the OBD port took a little Internet searching, but once I found it, it just plugs in. When the vehicle is turned on, the Hudly powers up and displays its WiFi network and password. After that is displayed, connect your iPhone to its wireless network, start AirPlay to the wireless display and then open the Hudly app. The app does ask you for your email address, but once that’s done it’s pretty straightforward to use. The clear display lifts up and down at a 45 degree angle so the goal is to have it at an angle where you can see the display comfortably from your position. The app has three checkmarks which can show either the vehicle speed, navigation or car diagnostics, however it can only present two of these at one time. Since you are mirroring your phone, everything is shown on the display. 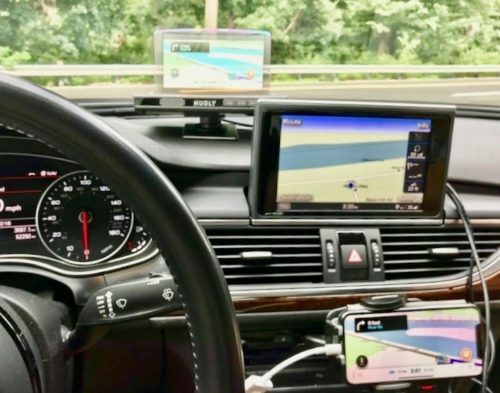 This allows for using other applications, specifically other navigation programs such as Apple Maps, Google Maps or Waze. Using the Hudly Wireless it become very clear that the company is focused on the quality of the display. The unit is essentially a mini monitor that shines the images onto a little clear piece of mirrored glass. The result is pretty amazing for a unit this small. While in the driver seat I was able to see whatever was mirrored onto the device in light, dark, sunny and cloudy conditions. It has brightness control on the front which I didn’t need to adjust. Most importantly the device didn’t block my view and didn’t distract me from the road, which is its main purpose. When mirroring from your phone, audio is played through a speaker on the device. The speaker sounds fine for navigation voices, however it’s not meant for music. This becomes the Hudly Wireless biggest issue. When you cast or mirror, audio is sent to the device to which you are casting. This becomes a problem when you want to listen to music through your car’s Bluetooth stereo and use the heads up display at the same time. There are some suggestions on the Hudly website but I couldn’t get it working. Being an IT tech I was able to figure out that the unit gets its video input by using a HDMI wireless mirroring dongle. I removed the HDMI dongle and plugged in a HDMI cable into the device and the other end into my iPhone connected to a Lightning to HDMI adapter and then I was able to display from my phone to the unit and play music using Bluetooth. This negates the wireless benefits of the device, but the power cable is already one cable running from the device to the power outlet, so this is just one more cable. I wasn’t able to get the OBD adapter to show me any information about my Audi. I emailed back and forth with Hudly support, which was very good and they shipped me out a replacement OBD adapter. Unfortunately that one didn’t work for me either. I tried the steps support suggested but still could not get it to read. It may have something to do with my car, or maybe my phone, or something else unrelated to the actual product, so I will hold judgment on the adapter for now. The Hudly Wireless has a lot of good going for it. It’s a splendid display and serves its main purpose which is to place important information in clear view. 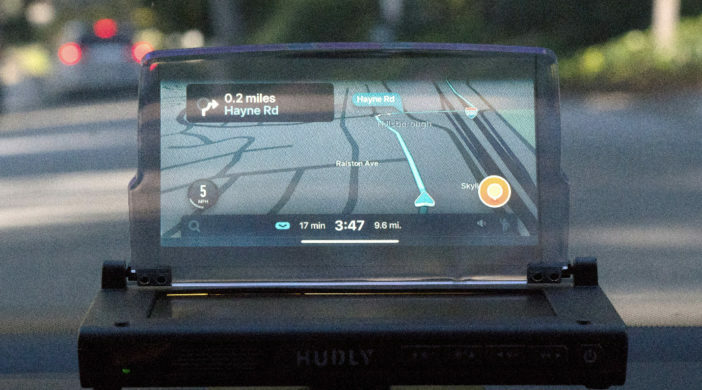 If you are in the market for heads up display, the Hudly Wireless is a viable option. There are still some issues that need to be worked out such as the audio routing issue and the companion app. The app does work, but it’s very limited and I found that the navigation feature didn’t work well and the speedometer was slightly off. Using a different navigation program is my suggestion. MyMac Review Rating is 8 out of 10. The display and usefulness is worth the price, and software fixes are needed.